“If slain in battle you will be glorious in heaven; and if alive you will inherit the earth. Arise, therefore, Arjuna, ready to engage in battle”. “Arjuna, you will not incur sin if you get ready to battle, treating pleasure or pain, gain or loss, and victory or defeat alike”. “Absorbed in the union (of mind to duty) do your work giving up attachment, maintaining the balance of mind regardless of success or failure. Achieving evenness of mind (regardless of result) is yoga”. Arjuna asked “Tell me Kesava, the distinguishing marks of a stable-minded person or a person who is deeply committed to virtue. How does he talk, walk and live his life? “A person who is not attached, who accepts good outcome without excitement and bad outcome without remorse is a person who is firmly founded in wisdom”. “As a result (of achieving the purity of mind) all grief of the person is gone. This person becomes serene, happy and stable”. “Just as water enters a sea without affecting the calmness of the sea, if desires enter the mind of a person without taking away his calmness the person has attained peace”. “He who abandons all selfish desires and has his actions free of selfish yearnings, he who abandons the selfish sense of “me” and “mine” attains peace”. “This (peace) is the divine state, O Partha. Having achieved it you are not bewildered again. Remaining in this state up to the end of your life you attain the ultimate bliss- the eternal life in God. “There was never a time when you and I did not exist; nor will the other persons. There will never by a time when anyone of us will cease to exist." Lord Krishna now dwells on the merits of embracing yoga as one’s goal. “At the time of departure the person whose mind can remain steady and full of devotion will reach the Lord. The ascetics freed from passion, enter what those learned in Vedas call eternal life. So saying, Lord Krishna revealed to Arjuna His Supreme form. Arjuna saw the form having many eyes, numerous faces, with divine ornaments and holding divine weapons. The Pandava (Arjuna) saw the entire universe with its manifold divisions united in the body of the God of gods. 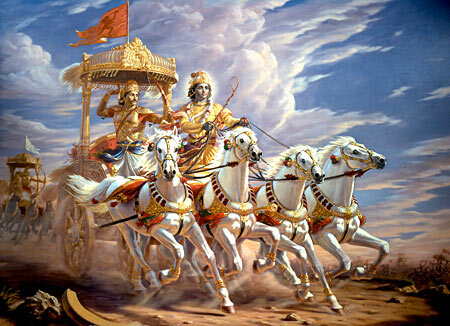 Arjuna then asked to see Krishna’s “Vishnu” form (four-armed) and then back to his usual, human form. In showing the destruction of the warriors and sons of Dhrtarashtra rushing into the mouth of the Lord, Arjuna was shown a glimpse of the future and he realizes he is merely an instrument of what God had already willed and planned. Thus, all pain and anxiety of war were erased. 1) The sattvika tendency represents purity and stability of mind. It brings spiritual enlightenment to a being. A person with the sattvika tendency is a seeker of happiness and is a seeker of knowledge and wisdom. 2) The rajasika tendency represents a passion for worldly achievement. It creates attachment to what has been attained and a desire for what is yet to be attained. It drives a person to action with the purpose of achieving his worldly ambitions. 3) The tamasika tendency represents a lack of desire for spiritual or worldly attachment. It binds a person to ingnorance, laziness, lack of effort and negligence. “I am beyond my perishable and imperishable expressions. That is why I am known in the Vedas as the Supreme Soul (“Purushottama”). (Krishna now lays down what qualities win His favor and what traits earn His disfavor and wrath). “And the demonic state is being opposite of the divine state. It is made up of hypocrisy, arrogance, conceit, anger, abrasiveness, lack of love and lack of wisdom.” He goes on to describe many versions of such demonic person and their consequences. “To engage in charity, sacrifice or self-discipline without faith is contrary to sat and is called ‘asat’. (In this chapter Krishna concludes his teachings again expounding righteous living, abandoning selfish desires, continuously striving to achieve spiritual growth, without abandoning the world. He indicates that the work of the world, if done rightly, contributes to spiritual fulfillment). Next Krishna admits that there are no beings on earth or in heaven completely free of the three tendencies. However, devoted to one’s own duty a person moves towards perfection. “Have you, O Partha listened to my words with undivided attention? Have your ignorance and delusion been removed” the Lord asked. The excerpts presented above were taken from the two books given below, from their translation of the verses into English. No new interpretations have been provided by this author. However, for the sake of brevity, repetitious stanzas have been omitted while some others were combined into larger verses as the substance was deemed similar and substantially complimentary. The short introductions indicated by italics within parentheses at the beginning of some Chapters are the author's additions.